If you walked past Kari Barba while she’s running errands, you probably wouldn’t surmise she is a tattoo artist. When she goes out to dinner with her wife, Teri Mullins, Barba rarely gets recognized by anyone other than the friends she’s made over her decades in Long Beach or through her business. To her neighbors and friends outside of tattooing, Barba is just a friendly grandmother with an infectious laugh who sometimes has her daughter dye her short hair pink; but she happens to also be one of the most famous, respected and important tattooers in the world. Even if you unknowingly went into Outer Limits Tattoo, there’s a good chance you still wouldn’t realize that the lady with few visible tattoos and a near-permanent smile is not only the owner but also a Long Beach legend and tattoo industry pioneer. Actually, you probably know more about tattoos today than Barba did forty years ago when she started in the business. The Minnesota factory worker hadn’t actually seen a tattoo growing up and certainly didn’t know anything about tattooing professionally other than that her new tattooer neighbor seemed nice enough and Barba’s boyfriend at the time wanted to get into it. Not long after she’d started seeing tattoos a bit more regularly, Barba’s sketches and artwork began to draw the attention of the friendly tattooer who’d recently moved into her building. She still didn’t know much about the art form or the industry, but a little encouragement from her neighbor and her ex’s desire to learn quickly tossed the young artist straight into the art form. Barba kept trudging through the misogynistic muck that was the tattoo world of the 1980s and 1990s until, eventually, she opened the door so wide for women that it could never be shut again. But Barba isn’t just considered an accidental trailblazer for her advancements in gender equality among tattooers, she also unintentionally revolutionized the style now known as “color realism” long before anyone else was even considering it. Throughout the first half of her career, highly detailed tattoos were thought to only be possible in shades of black and gray, a style popularized in the barrios of East LA in the 1970s by tattooers such as Freddy Negrete and Jack Rudy. But Barba, a lifelong artist, did not understand why it couldn’t be done with bright colors just as well, and she wasn’t about to let others sway her aesthetic decisions. Although she now realizes that tattooing equipment (such as inks and machines) at the time weren’t capable of leaving color details that would last in the skin over the years, her trial-and-error approach and the same tenacious work ethic she carries with her today brought the now-popular style into the limelight long before most were ready to accept it. 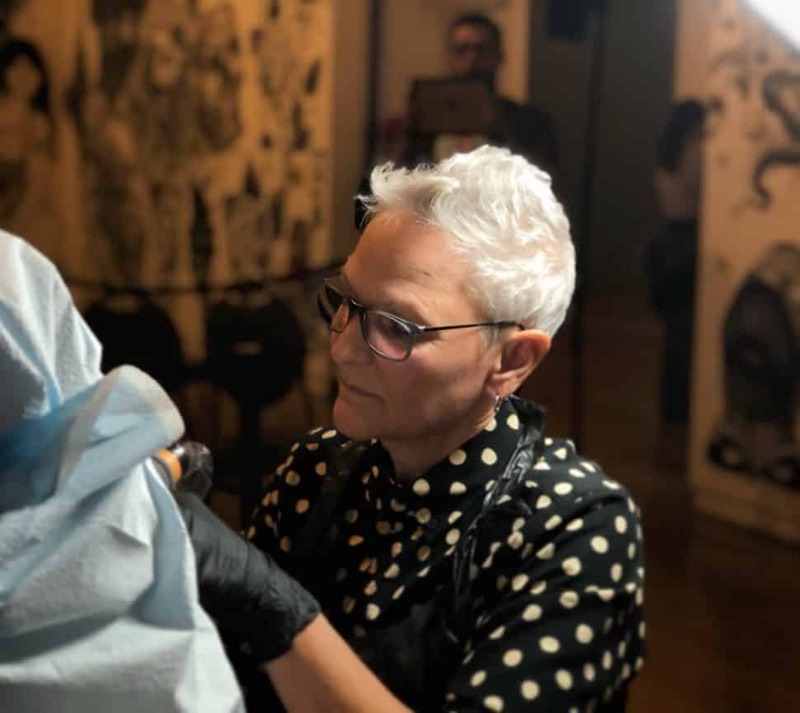 It’s hard to imagine what tattooing would be like today without Barba’s influence, although if you point out how much of an impact she’s had on both a local and worldwide level, she’s more than likely to downplay her overall influence. While others might get hardened after facing decades of the kind of adversity and bias she’s passed through, Barba still greets just about everyone with a hug and a smile, and she’s merely developed a thick skin over her unshakably tenacious and generally positive attitude. But regardless of whether she sees her handiwork in today’s tattooing, there’s a good chance that Long Beach’s current tattoo scene would look a whole lot different had Barba and her ex not been laid off from their factory jobs and left the Midwest for Southern California in the early 1980s. She likely wouldn’t have developed a yin and yang-like friendship with legendary tattooer Rick Walters (the classic gruff biker who effectively ran Long Beach’s tattoo scene through the end of the 20th century) after opening the original Outer Limits location in Anaheim in 1983 and then expanding all across the area, and she definitely wouldn’t have been asked by Walters to buy and restore the remains of Bert Grimm’s World Famous Tattoo when it unceremoniously closed down in 2002. As both the longest-running tattoo shop in America (and among the oldest in the world) and the last remaining bit of Long Beach’s historical tattoo site of the Pike, Bert Grimm’s closing was seen as a devastating blow to the tattoo community. More legends of the tattoo community had passed through the doors of Bert Grimm’s than arguably any other shop, but ownership trouble and a changing demographic flung the shop from grace around the turn of the millennium. The cost of transitioning from the obsolete state of Bert Grimm’s to an up-to-code Outer Limits was so great that Barba had to sell her home in addition to all but one of her other shops, but she unselfishly did what she needed to in order to keep both the country’s oldest tattoo shop and the unrivaled tattoo history of the area known as the Pike alive. Although it may not seem like one shop could have that much of an impact on all of Long Beach’s tattoo community, the space has not only become one of the top locations for local artists to work at but also one for guests to visit when they come in from out of town. Whether they’re stopping by to see some of the relics that Barba and her crew collected both during and after renovations or just to take a selfie and say they stepped foot inside the famous address of 22 Chestnut Place, Outer Limits has become as much of a museum destination for tattooers and collectors from around the world as it is a tattoo shop. In addition to the personal and financial sacrifices she’s made to own and update a piece of history, Barba’s gone out of her way to make sure that tattooing is represented as well as possible in Long Beach by doing outreach with city boards, museums, art galleries, speaking panels, and pretty much anyone else who’s willing to let her weigh in on the art form. That said, Barba’s most cherished way in which she’s contributed to the future of tattooing is undoubtedly in a biological sense. She may not be thrilled that she doesn’t get to see her son Jeremiah quite as often now that he’s left the Outer Limits family to open up Conclave Art Studio in Sunset Beach, but she’s as proud as any mom could be—and she knows that there’s always a chance for one of her granddaughters to join the family business in the coming years. As for her other family, the crew members at Outer Limits all know that there’s no other shop in the world with a leader or a history like theirs, and Barba will be the first to remind them if they ever forget that last part. Like the naval captains who’d walked the Pike before her, Barba runs a very tight ship (particularly for the generally lax tattoo industry) and makes sure everyone employed there maintains a certain level of professionalism and understands what the location means to both Long Beach and tattoo history. While other shops may be flexible on hours, attitudes, and other rules, Barba holds her employees to the same standards of promptness, cleanliness, and friendliness to which she holds herself.